My kids are splashing in the bath tub. I loved giving my nieces and nephews baths when I was a teenager. I twisted their soapy hair into dinosaur shapes, and told stories of mermaids swimming to distant shores. Afterwards, I wrapped them into fluffy towels and tucked them into bed. Kids were always easy, fun, or at the very least funny, and I made good money watching them. Until, of course I had my own. Mine are rarely easy, and are the opposite of good money. Like my previous charges, they are fun and funny, but those moments are sandwiched between frustrating ones as well. I see fellow moms post Facebook statuses saying, “I love every minute of being a mom!” and find myself wondering why I don’t feel that way. Now that I’m the mom, I can’t hand the tots off to anyone at the end of the day, two twenty dollar bills in hand, figuring job done well enough. Every minute, every moment I am responsible. It’s not the children themselves that are exhausting (although they have their moments.) It’s the work that takes to raise them into adulthood that’s so draining. These are the questions I can’t leave behind at the end of the night. These are what have me so exhausted all I want to do during bath time is to zone out, rather than cherish these days. He’s right. And I’m worried I’m missing it behind my veil of exhaustion and worry. So tonight I will tell them tales of shipwrecked pirates and far off islands. They are mine, my exhausting blessings. “Why the kids crashing interview video is a triumph for women,” Mamalode, March 2017. “We need to stop demeaning ‘Women’s work’, for the sake of our boys and our girls,” Parent.Co, March 2017. “Women Who Strike on March 8th Should Get a Raise,” Parent.Co, March 2017. “A Realistic Timeline Examining the Importance of Ample Maternity Leave,” Parent.co, March 2017. My son lost a balloon today. We were in the meat department of the grocery store. I was trying to find the cheapest cut of beef possible, and my kids were eyeing the St. Patrick’s display. Green and yellow balloons were tied in front of a suspicious rack of “O’Garlic”sausages that I doubt anyone in the old country had ever tried. Just as I was about to reprimand them for playing with the balloons, a man burst through the door pushing a tall cart of tightly wrapped packages of chicken thighs with which to replenish the shelves. My youngest, being slow to react and directly in the path of the cart, was instantly bulldozed. In typical protective mother fashion, I reacted by yelling his name much too loudly, causing a look of horror to cross the young employee’s face. My son looked startled, as seems just when you have been knocked down by a cart three times as tall as you. The employee, desperate to make amends, offered him a balloon. To a child, this is far better than never having been knocked down in the first place. Understanding the fraught nature of sibling dynamics, he offered my other son one as well. I had just turned back to the meat case when I heard wailing and saw a yellow balloon floating to the top of the ceiling. It should be noted that these cries far exceeded those of the son who was actually knocked down by the cart of meat. A second employee offered to get a ladder to retrieve the balloon. He returned with someone who had been stocking shelves, and with another man that I can only assume was the tallest person they could find in the store. It was obvious that the balloon was still well out of reach and any attempt to retrieve it would result in far greater injuries than being knocked over by a meat cart. I told them to please not worry about it. At that point, my younger son had already grown tired of his balloon and offered it to his brother. He accepted, although noting that it was somehow, imperceptibly inferior to his own, which was still floating over the frozen fish display meant to entice culinarily inclined Catholics. We continued shopping, wandering the aisles and forgetting half of the things we had come into the store for. 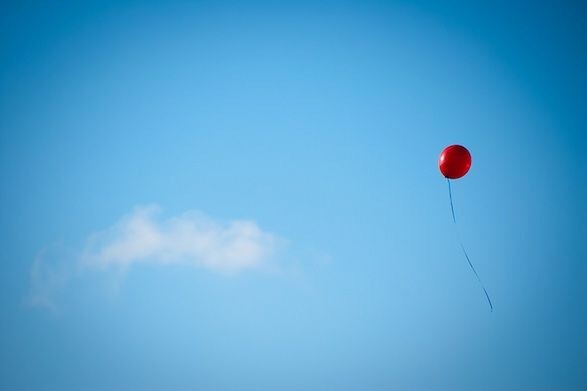 I felt bad for my son, despite that other maternal instinct of wanting to point out, “I told you that would happen.” There are few things more joyful for children than a balloon, that small, brightly colored defier of gravity. I know how he felt watching it float away. I get that same sinking feeling often now – whenever I hear a news story about melting glaciers, animals disappearing from the earth, or when I realize how quick they are outgrowing their shoes. We are steam rolling to my children’s future and, as in any home, the voices of mothers begging us to slow down are ignored. Childhood is short, and the future is unknown. I want keep the good moments – the ones where my children are basking in sunshine and watermelon drips down their chins – but try as I might, I can never quite hold on. The employee tracked us down in the cracker aisle, offering one of the fancy balloons from the floral department, the kind that I never would have ponied up the cash for. He pointed out that this one had a weight on it, so it couldn’t float away, but my son was far more enthralled with the StarWars characters that adorned it. I prodded him to say thank you, and he eventually took a break from grinning ear to ear to do so. My oldest weighed his options. “How loud will the sound be?” he asked, enthralled by the possibility. This time, he managed to surpress his desire to find out what would happen if he diverged from my directive and hold on for just a little bit longer. I’m going to try to do the same.